Now, Variety reports that EMI has filed a lawsuit against BlueBeat for copyright infringement. 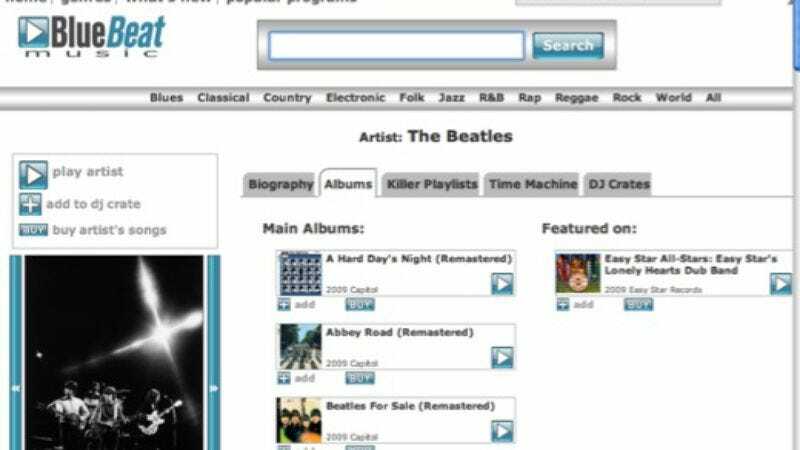 BlueBeat's parent company Media Rights Technology was unavailable for comment on the lawsuit, but as of this morning, The Beatles' albums and songs were still for sale. It'll be fascinating to see how this story develops, and if MRT can produce a legal rationale for their business model. The Variety story contains some curious information in that regard, noting MRT CEO Hank Risan's past manifestos on music-licensing and piracy. It seems he may be selling the previously unsellable in order to prove a larger point. 2. In the interest of journalism, I tried out BlueBeat's MP3 store yesterday. Not for The Beatles—I'd already bought the Mono box set a couple of weeks ago—but for AC/DC, another band which doesn't yet sell their music on-line, but is being offered via BlueBeat. I bought every album from High Voltage to For Those About To Rock (seven in all, since I skipped the live album) for $16.25. The downloading process was awkward and choppy, and failed several times, but I eventually got all my MP3s. Sound quality's fine, but not exceptional. So there you have it. Let there be rock.